"Good track, and great remix from Bad Tango!" "Great EP!!!! Really LOVE the original, nice sounds and awesome progressive feeling... Bad Tango remix is mind blowing and pure banger, can't wait to spiiiiiin!!!!!" "Nice release, the original is my personal fave.. has pretty much everything. Bad Tango remix is super tight, amazing production.. serious skills there.. Project Synthetic remix is full of energy, ideal for those who love their psy breaks rolling, and the Roboteknic remix is euphoric with a trancey vibe. Good stuff." "Brilliant release! Love all the mixes. I have to say that the original is my favourite - awesome production and such a cool deep vibe! Bad Tango remix is really tidy too :) Support in my gigs and podcast!" The serbian producer FLETRIC gives his debut on LOGARIDDIM RECORDS. With FIND THE LIGHT he has created a powerful, emotional and atmospheric track filled with brilliant musical ideas. If you like the deep and progressive side of breakbeats, then this one is for you! Mr. BAD TANGO is back again on LOGARIDDIM RECORDS and he brings us another distinctive dancefloor blaster. This remix is a flowing, psychedelic journey through Bad Tangos sound dimension with enough drive to keep you hardsteppin’ all night long. PROJECT SYNTHETIC also strikes back on our label. 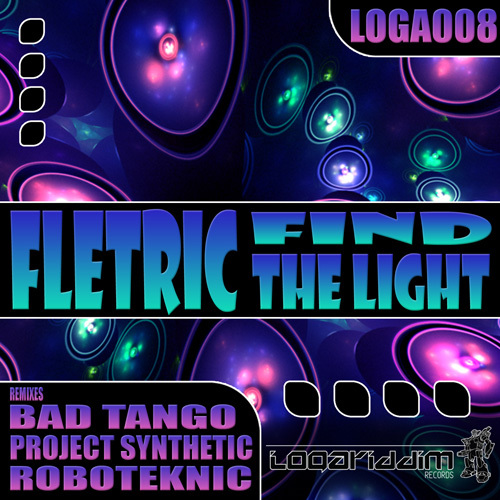 His version of FIND THE LIGHT is an intelligent arrangement of twisted and psytrance influenced soundscapes. Deep and playful at the same time. A brilliant tour through hypnotic rhythms. We also welcome ROBOTEKNIC from Down Under! He turned the original track into a melodic psybreaks tune with punchy beats and clean sharp synthlines. Enjoy the rollercoaster!